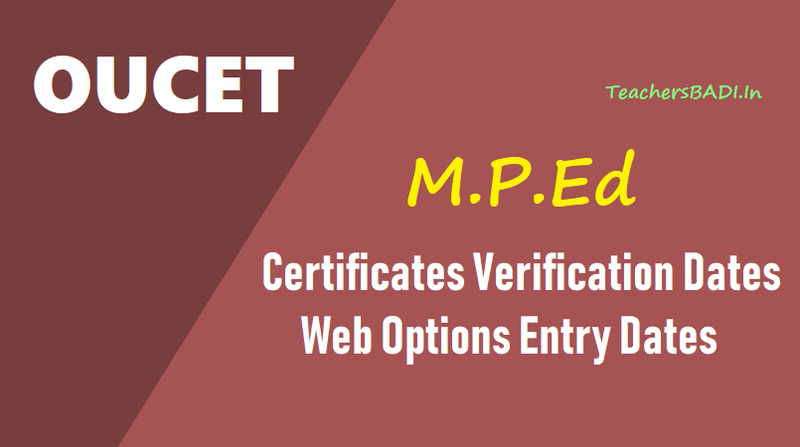 OUCET M.P.Ed 1st Phase Certificates verification, Web Options Entry dates: OUCET 2018 1st Phase of Certificate Verification & Web Options for M.P.Ed. course. The qualified candidates of OUCET-2018 are hereby informed that the certificate verification, exercising of web options and manual counseling will be commencing from 02.08.2018. The online payment for registration will be open from 31.07.2018. BC/EBC/Minority candidates whose Parent’s/Guardian’s annual income is Rs.1,00,000/- or less. In case of SC/ST Candidates, the Parent’s / Guardian’s income limit is Rs.2,00,000/ are eligible for Fee Reimbursement from government. In case the reimbursement of fee is not sanctioned, either in full or in part, by the concerned departments of Govt. of Telangana, the candidate has to pay the fee.